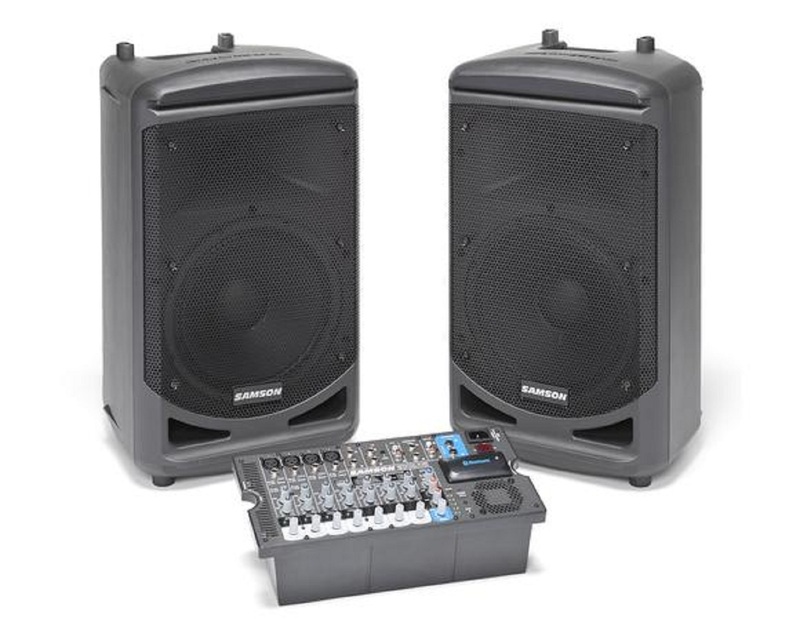 Samson`s Expedition XP1000 Portable PA system is an all-in-one sound system with incredible features and tons of power that packs into a single compact design. It`s perfect for live music performances, DJ sets, parties, group exercise classes, office presentations, academic lectures and anywhere else you want great sound. The XP1000 is Bluetooth-enabled, allowing you to wirelessly stream music from your smartphone, tablet or laptop. A removable 10-channel mixer with an impressive 1,000-watt (2 x 500), lightweight Class D amplifier powers the XP1000. The mixer features four Mic/Line input channels, each with XLR and 1/4" inputs for connecting microphones or active line level instruments. It also includes three stereo input channels for connecting external devices like MP3 players, keyboards and more. Each channel features Bass and Treble controls, and the first two Mic/Line channels have a selectable compressor to even out levels while preventing overload and distortion. The XP1000 even has a USB Wireless port for use with Samson XPD Series USB Digital Wireless Systems (sold separately). For precise control over your sound, the XP1000 provides 16 presets of high quality DSP effects, perfectly suited for vocals. For larger applications, the XP1000 provides stereo monitor outputs with level control to use the system with additional powered speakers. In addition, the mixer has a Phantom Power switch to enable the integration of condenser microphones into your PA setup. The XP1000`s 2-way vented speakers give you a clean, powerful stereo sound. Their 10" woofers produce excellent low-end punch, while the 1" HF drivers receive wide dispersion from 60 degrees x 90 degrees horns. For performance versatility, these ABS high-impact enclosures feature integrated 1 3/8" speaker stand mounts, as well as a tilt-back design for use as floor monitors. Two 25` speaker cables included.